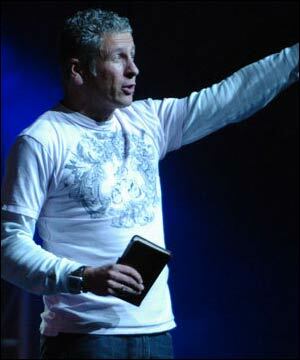 On Saturday night, Louie Giglio opened the conference up because, well, it’s his conference. Thankfully, Louie is a passionate, engaging, and Christ-centered speaker. In fact, his passion practically oozes out of his eyeballs when he speaks. His message was framing some of the Passion vision and the Christian story that we are part of a story that is so much bigger than ourselves. We can trade something small to be part of something large. Giglio used the story of Jesus raising Lazarus from the dead in John 11 where Lazarus had to die- but that the Glory of God through Jesus was revealed through Lazarus’ death. Lazarus’ death was part of a bigger story. Sometimes we suffer, we struggle, or we succeed- but we must remember that we go through those things to make the glory of God through Jesus Christ known. The Sunday morning speaker was Beth Moore. I have always heard great things about Beth and her Bible studies- but I have to be honest, I didn’t really connect to her message. This is petty- but her hairstyle really distracted me. I couldn’t figure out what was on top of her head. Was it a birds nest? A squirrel? She also sounded like she was yelling the whole time—-a yelling monotone. That said, as I look back over a few things I wrote down- I found one little nuggets. It was this, “We are not called to be a pastor, teacher, missionary, etc….but we are called to Christ and to go where ever Christ leads us.” This is pretty important to me and Andrea as our desire is to go where ever God leads us. We evaluate the year and where we our by that guiding principle. Sunday evening was Francis Chan. 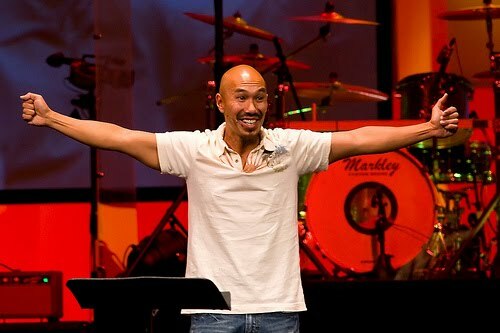 I heard Francis Chan at the Passion Regional Conferences in 2007 and really liked him. He was doing his Crazy Love stuff then. I’ve tried listening to podcast from his sermons and have had a hard time getting into them. I had this same feeling at Passion. I felt he was a little all over the place as he spoke. I did get that he felt that our generation needs to put a greater emphasis on being people of the Book. That we should tremble at the Word of God. I certainly agree with this and this is something that I have been emphasizing in my own ministry. Francis said some other cool things (so I am told), but I honestly missed them! Monday morning brought Andy Stanley to the stage at Passion. I really enjoy Stanley’s style. I have seen him most recently at the Catalyst OneDay Conference in Baltimore in November. One of my students summed his talk up the best when he said, “Andy’s talk was perfect for college students.” Andy spoke about knowing who you want to be before pursuing what you want to do. He said that many times we get those things switched around. He encouraged everyone to think through about the things they would want family, friends, co-workers to say about us at our funeral and that those things can become guiding principles to who we are to become. Our doing, our lifework will flow from our being. This really made sense for our students and for me. We had to leave Monday afternoon and did not get to hear John Piper speak, although he provided a link to his manuscript on his website where you can read the message. If you made it through this long post, then you deserve something special. I have an unused Hillsong United Ticket just for you! Oooh! I want the ticket! I want it! Then MY unused ticket will have a friend! I'll throw in my unused hillsong ticket too! just for funsies!